Paul Homewood has taken a look at an article in yesterdays Daily Mail – A quarter of the world could become a DESERT if global warming increases by just 2ºC. Aridity is a measure of the dryness of the land surface, obtained from combining precipitation and evaporation. ‘Aridification would emerge over 20 to 30 per cent of the world’s land surface by the time the global temperature change reaches 2ºC (3.6ºF)’, said Dr Manoj Joshi from the University of East Anglia’s School of Environmental Sciences and one of the study’s co-authors. The research team studied projections from 27 global climate models and identified areas of the world where aridity will substantially change. 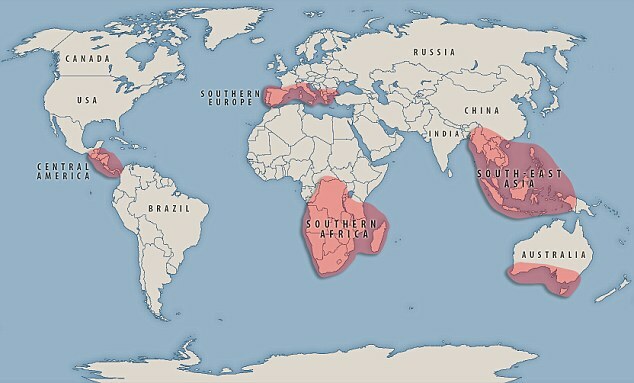 The areas most affected areas are parts of South East Asia, Southern Europe, Southern Africa, Central America and Southern Australia. Now, having read Al Gore’s authoritative book An Inconvenient Truth there are statements first about extreme flooding, and then about aridity (pages 108-113). The reason for flooding coming first is on a graphic of twentieth-century changes in precipitation on pages 114 & 115. This graphic shows that, overall, the amount of precipitation has increased globally in the last century by almost 20%. However, the effects of climate change on precipitation is not uniform. Precipitation in the 20th century increased overall, as expected with global warming, but in some regions precipitation actually decreased. The blue dots mark the areas with increased precipitation, the orange dots with decreases. The larger the dot, the larger the change. So, according to Nobel Laureate Al Gore, increased precipitation should be the far more common than increased aridity. If all warming is attributed to human-caused climate change (as the book seems to imply) then over a third of the dangerous 2ºC occurred in the 20th century. Therefore there should be considerable coherence between the recent arid areas and future arid areas. The Daily Mail reproduces a map from the UEA, showing the high-risk areas. There are a couple of areas with big differences. In the 20th century, much of Australia saw increased precipitation. Within the next two or three decades, the UEA projects it getting considerably arider. Could this change in forecast be the result of the extreme drought that broke in 2012 with extreme flooding? Certainly, the pictures of empty reservoirs taken a few years ago, alongside claims that they would never likely refill show the false predictions. One such reservoir is Lake Eildon in Victoria. Below is a graphic of capacity levels in selected years. It is possible to compare other years by following the historical water levels for EILDON link. Similarly, in the same post, I linked to a statement by re-insurer Munich Re stating increased forest fires in Southern Australia were due to human activity. Not by “anthropogenic climate change”, but by discarded fag ends, shards of glass and (most importantly) fires that were deliberately started. The UEA makes no claims about increased aridity in Northern Africa, particularly with respect to the Southern and Northern fringes of the Sahara. Increasing desertification of the Sahara used to be claimed as a major consequence of climate change. In the year following Al Gore’s movie and book, the UNIPCC produced its Fourth Climate Assessment Report. Working Group II report, Chapter 9 (Pg 448) on Africa made the following claim. In other countries, additional risks that could be exacerbated by climate change include greater erosion, deficiencies in yields from rain-fed agriculture of up to 50% during the 2000-2020 period, and reductions in crop growth period (Agoumi, 2003). Richard North took a detailed look at the background of this claim in 2010. The other African countries were Morocco, Algeria and Tunisia. Agoumi 2003 compiled three reports, only one of which – Morocco – had anything near a 50% claim. Yet Morocco seems, from Al Gore’s graphic to have had a modest increase in rainfall over the last century. The UEA latest doom-laden prophesy of increased aridity flies in the face of the accepted wisdom that human-caused global warming will result in increased precipitation. In two major areas (Southern Australia and Northern Africa), increased aridity is at add odds with changes in precipitation claimed to have occurred in the 20th Century by Al Gore in An Inconvenient Truth. Yet over a third of the of the dangerous 2ºC warming limit occurred in the last century.